The Legend of Spyro: The Eternal Night is a video game in the Spyro the Dragon series. It is the second game in "The Legend of Spyro" trilogy, released for the PlayStation 2, Game Boy Advance, Nintendo DS and Wii. The gameplay is similar to its predecessors. Spyro must travel to the end of a level in a linear fashion and defeat the boss at the end of each level, defeating enemies with his combat moves. Spyro will learn different breaths from the Chronicler, who is met in Dreams which occur to Spyro during the course of the game. The breaths are a tool for defeating enemies. They come in different elements; fire, ice, electricity and earth. Spyro can also use furies, which are big blasts of elemental magic. Spyro is required to obtain a certain amount of purple gems to be able to use these skills. Spyro is able to learn the skill of "dragon time" from the Chronicler. This skill allows Spyro to slow down time. He can use this ability to jump on platforms which are too fast to land on with his normal speed. He can also use this ability to defeat enemies easier. Throughout the levels there are items called "quills". Each "quill" collected gives the player 5 pieces of concept art. 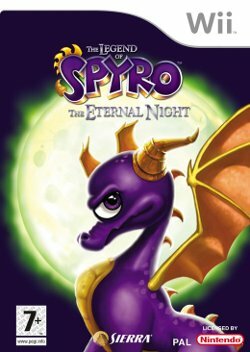 The Legend of Spyro: The Eternal Night continues the storyline established by The Legend of Spyro: A New Beginning, which ended with the defeat of Cynder, a black dragon in servitude for an enemy called the "Dark Master". In The Eternal Night, a new antagonist - "Gaul" the Ape King - has risen to power and is intent on resurrecting the Dark Master. After Spyro repels an attack by the Ape army, Ignitus, the leader of the dragons, sends Spyro to seek out a tree that Spyro saw in a vision while Ignitus looks for help against the Apes. As Spyro searches for the tree, he also searches for another dragon known as the Chronicler, who asked Spyro in a vision to find him. Spyro is soon captured by pirates and forced to engage in gladiatorial combat. When he escapes the pirates, he discovers that the Apes have established a base on the mountain of Malefor, in an effort to revive the Dark Master using a lunar alignment called the Night of Eternal Darkness. He also discovers that they are keeping Cynder, a friend from A New Beginning, prisoner, hoping to turn her to their side. Spyro eventually finds the Chronicler, who tells him about the Dark Master. According to him, the Dark Master was once a dragon that had gone evil. He was exiled and sealed away by the dragon elders, but not before he taught the Apes how to use dragon magic. The Chronicler wants Spyro to hide from the Apes until a later time, but Spyro insist on going to Cynder’s aid. When he gets to the mountain, the Ape King, Gaul, orders Cynder to attack Spyro. When she attacks Gaul instead, he knocks her out and challenges Spyro himself. During the fight, the lunar alignment comes, and the evil energy it generates is channeled through Spyro and at Gaul, destroying him. When the alignment passes, the mountain crumbles around Spyro and Cynder, entombing them until they are needed again. ↑ IGN: The Legend of Spyro: The Eternal Night Preview. Retrieved July 11, 2007. ↑ GameSpot: The Legend of Spyro: The Eternal Night Cutscene 1. Retrieved August 21, 2007. This page was last edited on 30 November 2009, at 03:45.